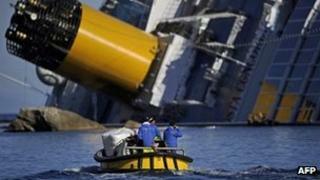 Work to salvage the capsized Costa Concordia cruise ship is due to start next month, the owners say. The contract was won by US-based company Titan Salvage and an Italian firm specialising in underwater ship repairs, Microperi, Costa Cruises said. Under the plans, the Concordia will be re-floated in one piece and towed to a port on the Italian mainland. Thirty-two people died when the ship hit rocks off the Tuscan island of Giglio with 4,200 people on board. The operation, which is expected to take a year, still needs to be approved by the Italian authorities. The ship lies half-submerged on its side on a steep underwater incline, near the island's main port. Airbags will be used to re-float the ship once the gash ripped into its port side when it ran aground has been mended, the BBC's David Willey reports from Rome. Once the Concordia has been removed, the sea floor will be cleaned and measures taken to help marine flora to regenerate. Work to drain more than 2,000 tonnes of fuel and sewage from the ship was completed last month, easing fears that the pristine waters around Giglio could be badly polluted. The salvage operation will use the port of Civitavecchia, on the Italian mainland, as a base, in an effort to minimise the impact on tourism and port activities in Giglio. "As was the case with the removal of the fuel, we have sought to identify the best solution to safeguard the island and its marine environment and to protect its tourism," Costa Cruises chief executive Pier Luigi Foschi said of the winning tender for the operation. Nine people are being investigated in connection with the disaster, including the captain, Francesco Schettino, who is under house arrest on suspicion of manslaughter. He denies any wrongdoing. Thirty bodies have been recovered from the vessel, with a further two people still missing.